To some, a visit to Munich might mean steins of beer, bratwurst and oom-pa-pa music, typical for the city’s largest and most famous party – Oktoberfest. Ask the locals, however and they will describe any number of aspects they love about Munich – from the sprawling parks and world-class shopping to up-and-coming trendy artist neighborhoods. There is one exciting part of Munich life that almost everyone can agree on – getting out of it. The city’s proximity to the idyllic Alpine landscape means that the verdant foothills can be reached in less than an hour; the most extreme peaks of the Alps within two. We’re no mountain climbers and we certainly don’t ski, but, like us, everyone can enjoy the classic Bavarian villages, cheese factories, beer gardens, hiking and biking, and there is one mountain everyone is more than welcome to climb. So let’s start right at the top. Just south of the Bavarian town of Garmisch-Partenkirchen, we drove our tiny Smart car along a road which snakes through a valley dotted by half-timbered houses and ends abruptly on the shore of an ice-blue lake, called the Eibsee. As we stared out over the sea and looked up, we spotted thousands of feet of reinforced steel cable which transport cable cars stuffed with people 2,962m or 9,718 ft up to the mountain in under ten minutes. The Zugspitze, the highest point in Germany, actually sits on the Austrian/German border, and although the restaurant, beer garden and all the skiing is located on the Bavarian side, the viewing platform is split between the Bavarian side in Germany and Tyrol, Austria. In fact, in addition to the Eibsee Cable Car, the top of the mountain can also be reached from Austrian side by the Tyrolean Zugspitze Cable Car. There is a third option to reach the top as well: The Bavarian Zugspitze Railway. The 45-minute train ride begins by chugging up and through the fresh pine forest before slicing its through the inside of the mountain. While I found it nerve-wracking to speed through three climate zones while zipping up the side of a glacier in a cable car, it was far better than the train ride back down through the dark 3-miles long tunnel, which is just a much slower, more claustrophobic method. No matter how you choose to reach the summit, make sure to dress warm, as the Zugspitze is also the meeting point of three glaciers. Whether you are skiing or just out enjoying the view of the Alps, even summer days at the top can be chilly. Of course, if you get cold, there are two restaurants, a beer garden and a Zugspitze Museum to keep you warm indoors. While you are up at the top, make sure to get your picture taken with the Zugspitze Photostop Camera, and once you get home, you can download the picture from the website for free. This lake, Germany’s fourth largest, sits just 27km (16 miles) outside of Munich, but its expansive blue waters dotted with sailboats, jet skis, and canoes make it feel worlds away from the bustle of the Bavarian capital. The lake is no hidden gem, but rather a popular escape for everyone from Munich socialites sipping wine in elegant lakeside restaurants (we’re pretty sure we spotted at least one German celebrity) to families hiking and biking their way around the lake’s well-paved perimeter path. We stopped off at several points along the lake by car, but the main town of Starnberg can also be reached by commuter train from Munich. Starnberg itself is an upmarket yet traditional Bavarian town with shops, restaurants and quaint homes lining narrow village roads. That’s right…the famous Sleeping Beauty castle located in California’s Disneyland Park was based on this famous 19th century castle. Neuschwanstein, which literally means ‘new swan stone’ in German, is a magnificent structure, perched neatly on hill overlooking the sprawling valley and village of Hohenschwangau near Füssen in southwest Bavaria. Commissioned by Ludwig II of Bavaria as his personal refuge, the reclusive king spent less than six months here in his still unfinished castle before he was captured and fell from power. The barely-lived in symbol of 19th century Romanticism was an extravagantly designed homage to classical composer Richard Wagner and also contains thousands of depictions of swans sewn into pillows, drawn into wallpaper and carved into wooden door handles and frames. Since opening to the public immediately upon the King’s death in 1886, over 60 million people have visited the castle, making this one of Germany’s most popular tourist attractions. Ironically, the town below, where 1.3 million people per year line up for tickets, felt to us very similar to Disneyland, with traditionally-themed restaurants and hotels (with their costumed staff) lining village streets crowded with horse and carriages waiting to take visitors up to the castle, street performers and, by 10am, crowds of people heading up to visit the castle, which sees over 6,000 visitors pass through its gates each day in the summer. 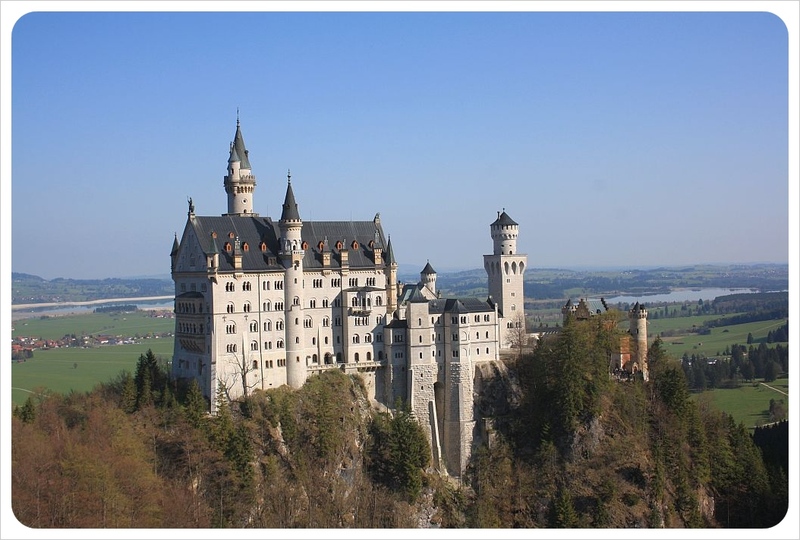 We would most certainly recommend taking part in the 35-minute guided tour of Neuschwanstein, which is the only way to see the inside of the castle, and a combo ticket will get you entry to Ludwig’s second castle, Schloss Hohenschwangau, located on the hill right next door. However, make sure to hike up and around Neuschwanstein, stopping for a picture along the Marienbrücke bridge, which affords spectacular views of the structure itself. On your way back down, opt for the path alongside the river (which flows under the bridge above). At times the path lays lazily along the wide river bank, while other times you are suspended over river rapids on steel steps bolted into the side of boulders. The path is perfectly safe, family-friendly and gets some hunger-inducing adrenaline flowing right before you arrive back in the town for lunch! If you have time, you can even hike to Austria from here. There are both long and short distance walking trails, and paths leading all the way round the Alpsee lake at the bottom of the hill. This mountainous region about 80km (50 miles) south west of Munich includes several traditionally Bavarian stop-offs plus fabulous hiking and biking opportunities for outdoor lovers, but unless you’re up for a major round trip cycle, we’d suggest picking up a rental car in Munich for the day. We rented our tiny Smart car from Enterprise for just €16 ($22) per day. Our first stop was Schloss Linderhof, the third and smallest of King Ludwig’s palaces and the only one he lived to see completed. The palace was inspired by the French palace of Versailles, and its gardens, which combine Baroque and Italian Renaissance styles, are considered one of the most beautiful creations in Europe. Close to the palace you find the village of Ettal, and its ornate 14th century Benedictine Ettal Abbey is also worth a visit. The fresh air, sunny skies and great weather have made this part of Bavaria a popular health resort location, with Ettal located near the picturesque villages of Oberammergau and Unterammergau and countless spa towns found in this area of Southern Bavaria such as Bad Kohlgrub and Bad Tölz (don’t be fooled by their names ‘Bad’ means ‘spa’ or ‘bath’ in German). The rolling green landscape of these Alpine foothills also make for some of the best golf breaks in Germany. Egmating near Starnberg offers some of the most relaxing golf Europe has to offer, with stunning views over the Alps. Will you visit Germany while you’re in Europe? Munich & beyond are definitely worth a visit! Love these photos! I want to be inside that castle! Seriously one of my favorite parts of the world! I just can’t get enough of Munich and the area to the south. Linderhof is my personal favorite castle but I enjoy just staring at Neuschwanstein. It is really amazing. I will be visiting Mittenwald this summer and am looking forward to it. Thank you Debbie! It really is a beautiful area. 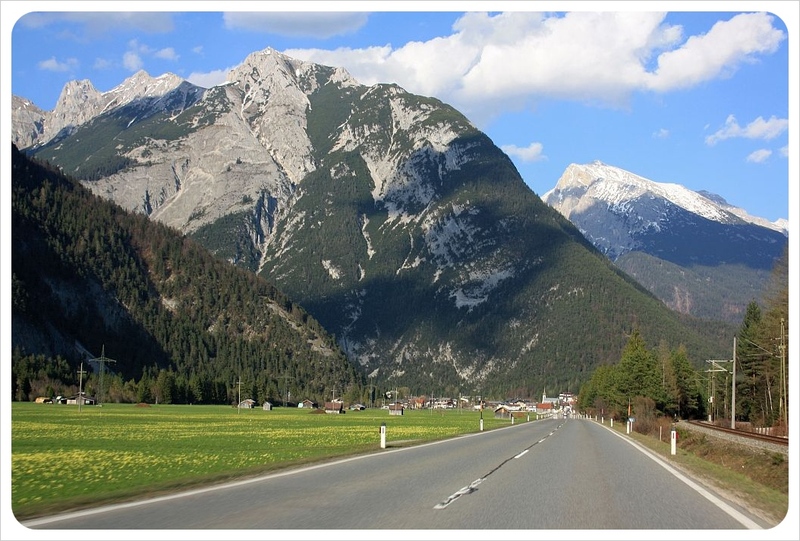 Mittenwald is supposed to be gorgeous – can’t wait to go there. Chiemsee & Schloss Herrenchiemsee are also high on our list. There is just SO MUCH to see in Bavaria!! Agreed! Munich (and the surrounding area) is my favorite place in the world. It was the first time for both of us that we spent an extended period of time in that area and we absolutely loved it! There’s so much more to see than the parts that we got to explore – we will be back for sure! So nice to see other areas outside of Munich and Neuschwanstein. They’re both nice, but in my opinion the really interesting places are just outside of Munich as you’ve highlighted. Totally agree! I think Neuschwanstein should be on every visitor’s list, however, Linderhof is so beautiful too, but often overlooked by travelers. The same with Fuessen – everybody goes there because it is so close to Neuschwanstein and it definitely is a charming little town, but there are so many other cute little German towns in Bavaria. Great piece, we’re planning trip to Munich and Neuschwanstein in September. That’s great, and not a bad time to go, actually. Are you going for Oktoberfest? It starts mid-September. If you’re there then, you have to go! What an awesome experience! Beautiful photos – I absolutely love Bavaria, it has such a rich mixture of history, dramatic landscapes and breathtaking architecture. Thanks so much! The things you list are exactly what we love about the area! We just love the alpine farm houses, so cute! We spent time very briefly in Bavaria in general, but it’s really refreshing to read a blog post about the area without it strictly focusing on beer festivals and the usual cliches. Great post! Hey thanks Dayna – Bavaria is so much more than just the beer and lederhosen, that’s for sure. Glad you enjoyed the post! Sounds absolutely wonderful! All of it! And only 22$ for a daily car rental?! WOW! So cheap! Was this for a manual or automatic? We want to rent a car to drive around the region outsde of Munich and just trying to figure out where we want to stop in!